This top mount refrigerator has a sleek look and provides ample storage space. The convertible zone feature provides flexibility of switching a freezer compartment to a fresh food space, while Samsung's Twin Cooling Plus system keeps food fresher longer. Your 17.5 cu. ft. Top Freezer Refrigerator in White is ENERGY STAR certified, and features upfront temperature controls and adjustable racks. GE appliances provide up-to-date technology and exceptional quality to simplify the way you live. With a timeless appearance, this family of appliances is ideal for your family. And, coming from one of the most trusted names in America, you know that this entire selection of appliances is as advanced as it is practical. Your GE ENERGY STAR 21.2 cu. ft. Top Freezer Refrigerator in White easily accommodates gallon storage. This Frost Free refrigerator is icemaker ready for the IM4D optional ice maker sold separately. The Deluxe Quiet Design and Never Clean Condenser allow for complete ease of use. Easily reversible door hinges lets you set up your refrigerator for the best use. 28 3/4-inch 17.5 cu. ft. Top Freezer Refrigerator in Black Stainless Steel - ENERGY STAR® This top mount refrigerator has a sleek look and provides ample storage space. The convertible zone feature provides flexibility of switching a freezer compartment to a fresh food space, while Samsung's Twin Cooling Plus system keeps food fresher longer. 28 3/4-inch 17.5 cu. 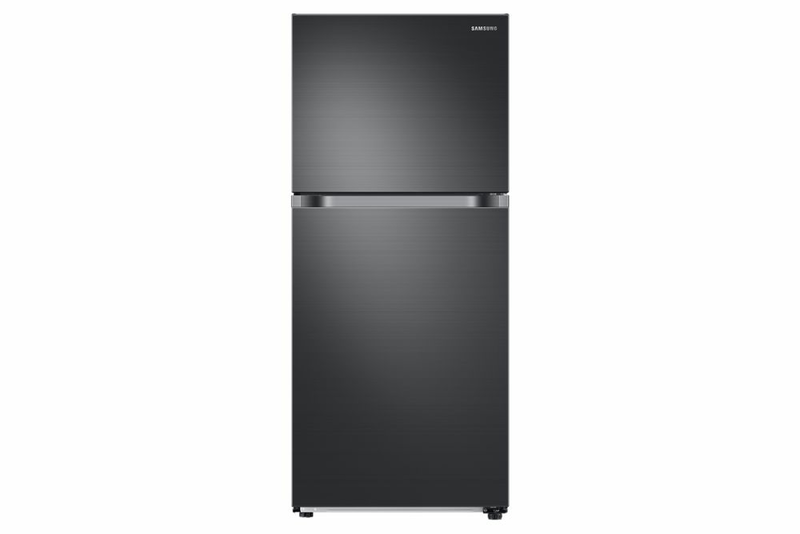 ft. Top Freezer Refrigerator in Black Stainless Steel - ENERGY STAR® is rated 4.5 out of 5 by 35. Rated 5 out of 5 by cherchef from Love it! Looks great in my kitchen, easy to clean... Love it! Looks great in my kitchen, easy to clean and has lots of room in freezer and frig. Rated 5 out of 5 by HomeDepotCustomer from very top fridge in it's class!... very top fridge in it's class! Rated 5 out of 5 by fatty07 from we just love this product. we we're updating our kitchen and got a matching Samsung stove too!!! we just love this product. we we're updating our kitchen and got a matching Samsung stove too!! !